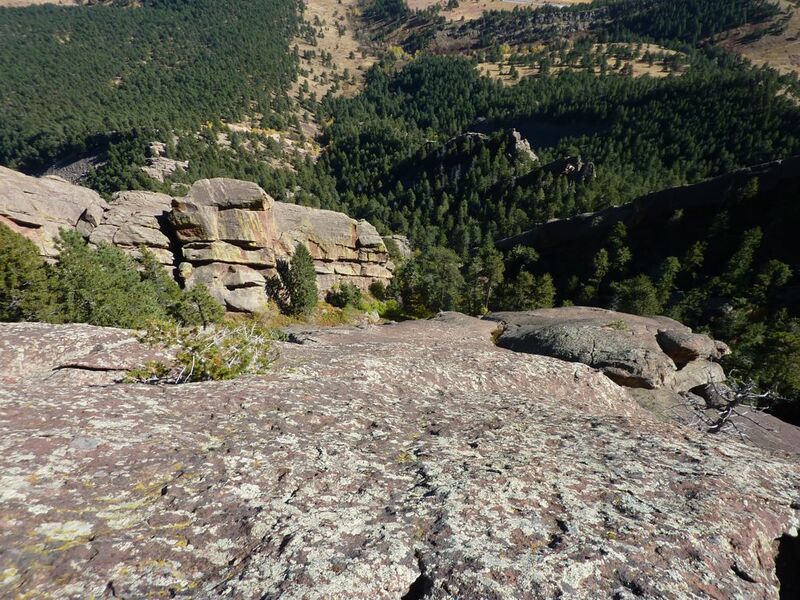 The 4th flatiron is more of an “adventure climb” than the others. It’s divided into three segments separated by trees, ferns, and poison ivy, and the climbing is much more varied, with crack, slab, and a lot of low-angle, off-width, smooth water groove. As claimed on Mountain Project, it’s not something you do more than once, but I think it should still be experienced. Given the hiking between segments, I chose to climb in trail runners rather than rock shoes, a decision that added considerable spice to an otherwise-moderate route. Rather than simply smearing up the rock, I had to look for nubs, stemming opportunities, and places to wedge a foot or knee. The first segment was pretty straightforward, with a crux step just above an arch/cave, and I found the downclimb into the first gap on the first try. From there, I carefully picked my way through a steep field of very healthy poison ivy to the off-width crack in the second segment. This was probably the toughest pitch, especially in trail runners, as the bottom of the groove was a bit too steep to smear. It also features a fixed cam partway up, which I spent too much time and knuckle skin trying to un-fix. With some jamming, pressing against the sides of the crack, and occasional detours onto the face on either side, I eventually made it to the next section of woods, then promptly took a wrong turn onto the upper part of the second segment. One downclimb later, I trampled some ferns to reach the final segment, another awkward crack followed by a bit of slab. Remembering that the top was supposedly close to the summit of Green Mountain, I decided to bushwhack up to the summit to see what that was about. I learned that (1) the 4th flatiron is not particularly close to the summit, and (2) there are two trails to the summit. After checking out the view, watching the ravens harassing a couple of hawks, and making use of the copper mountain-labeling plaque, I took a trail that eventually deposited me back at Chautauqua. I had planned to climb the 5th flatiron as well, but felt less than enthusiastic about trekking clear across the park again.